Aries: Mars is the factor of age and employment for Aries zodiac. It impacts on conflict and enemies. Worship lord Hanuman. Taurus: Mars is the factor of marital life for Taurus zodiac. The support part is with Mars. Visit religious place on Tuesdays. Gemini: Mars is the owner of income and debt for Gemini zodiac. It makes balance. Donate sweet products on Tuesdays. 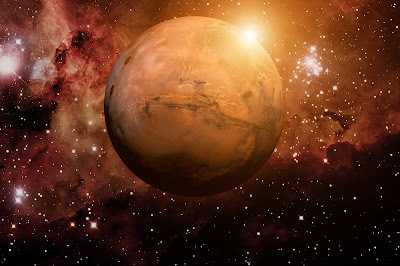 Cancer: Mars is the factor of career, prestige and respect for Cancer zodiac. Mars is also responsible for happiness from child. Chant Mars psalm daily. Leo: Mars is the owner of happiness and prosperity for Leo zodiac. It also strengthens their fortune. Worship lord Hanuman daily. Virgo: Mars controls age and career for Virgo zodiac. Journeys also can be seen through Mars. Donate sweet products on Tuesdays. Libra: Mars controls marriage and domestic life of Libra zodiac. It handles speech and financial condition. Chant Mars psalm. Scorpio: Mars controls disease, debt and conflict for Scorpio zodiac. It impacts on personality. Chant Hanuman Chalisa. Sagittarius: Mars controls child and education for Sagittarius zodiac. Mars is responsible for spiritual achievements. Keep fast on Tuesdays. Capricorn: Mars gives happiness and prosperity to Capricorn zodiac. It also gives wealth regularly. Donate sweet products on Tuesdays. Aquarius: Mars makes Aquarius zodiac capable and courageous. It gives prestige-fame and respect. Worship lord Hanuman daily. Pisces: Mars gives domestic happiness and wealth to Pisces zodiac. It makes person fortunate. Use copper and red color. Good Luck: It is extremely beneficial to repay the debt on Tuesdays. This avoids the debt problem.